When Roger Federer claimed the first Paris Masters title of his career, in a 6-1, 7-6 (3) win over home favorite Jo-Wilfried Tsonga it certainly revised the rap on Federer's 2011 from dire to at minimum, acceptable. Coming into this fall season, Federer had only captured the crown at Doha back in January. In the intervening months, he lost the Roland Garros final to his irrepressible younger rival Rafael Nadal; then watched Nadal's mojo, No. 1 ranking and a raft of titles get hijacked by another still younger rival, Novak Djokovic. With the surge of younger players, Federer turned 30, usually the age where players start thinking about retirement communities of tax haven nations. Then to add insult to injury, Andy Murray, the black sheep of the Big Four, also passed him in the rankings after a strong Asian swing, winning titles in Bangkok, Tokyo and Shanghai while Federer sat idle. As suddenly as Federer's reign seemed resolutely finished, he stormed back to win Basel and the Paris Masters, in essence saving his season. When Federer re-appeared in Basel, he (mathematically at least) was on the verge of falling behind David Ferrer and winding up fifth in the ATP Tour rankings. Quelle horreur indeed. He will now go to the ATP World Tour Final in London (heretofore known as the ATP WTF) to tussle with another hometown, if not home nation, favorite Andy Murray to decide the year end No. 3 ranking. What does it all mean when? 1) It means Federer's hungry to win. There has never been a champion with as gilded a resume as Federer and that means he's a proud man. Otherwise, we would've seen a lot more listless, "I don't feel like it today," performances across his career especially outside the majors. That's never been Federer, as evidenced by his 802 career wins to date, good for 7th all time. When he shows up on a tennis court, he's there to win. I would venture that it's a large part of the reason he takes the fall seriously. There's still tennis to play and titles to win. Even though the majors are in the rear view mirror, the thrill of winning be it in Basel or Stockholm is still the thrill of winning. 2) It means Federer's healthy. Moreover, it means that his main rivals aren't. Robo-Nole Djokovic has gone from invincible to the infirmary, while Rafa Nadal is suffering from a bad case of Djokeritis. Federer's post-US Open downtime has gotten him healthy and ready to rumble. 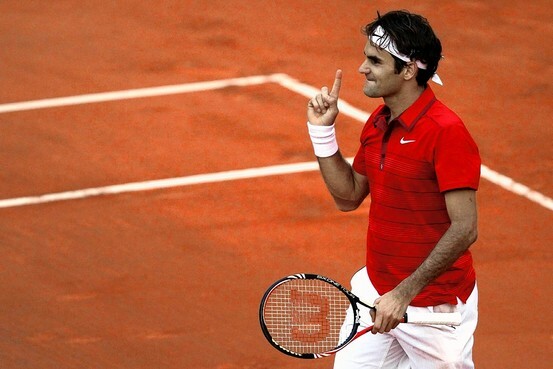 3) Federer's still an elite player. Of his 12 losses to date in 2011, seven were to either Nadal or Djokovic. Moreover, the only player then ranked outside of the top ten to beat him was current World No. 6 Jo-Wilfried Tsonga on the comeback trail from injury. Federer still beats the rank and file with ease, especially when he's coming off a period of rest. I would still have a tough time picking Federer to beat Djokovic or Nadal (except maybe on a fast indoor hardcourt like we'll see in London next week), he's even money versus Murray (Fed's 6-8 lifetime against the Brit and hasn't faced him in 2011), but against the rest of the field, I'd take that bet. Federer may no longer best the hands-down best player in the world anymore, but he's still close, and he's certainly the best of the rest. Good read. I usually ignore poster links from ESPN, but yours was well written. FX77, thanks for stopping by, glad you enjoyed the post. Keep on visiting. Very low error count for the Mighty Fed against to heavy hitters bodes well for him. This is no fluke the man is seeing the ball well. You think the shanks are gone for good?